VR headsets got off to a strong start in their first year of consumer shipments. Canalys predicts shipments will exceed 2 million units worldwide in 2016. This number is forecast to grow to 20 million by 2020. The lion’s share of 2016 shipments are basic VR headsets that rely on other devices, generally being tethered by cable to a desktop PC. 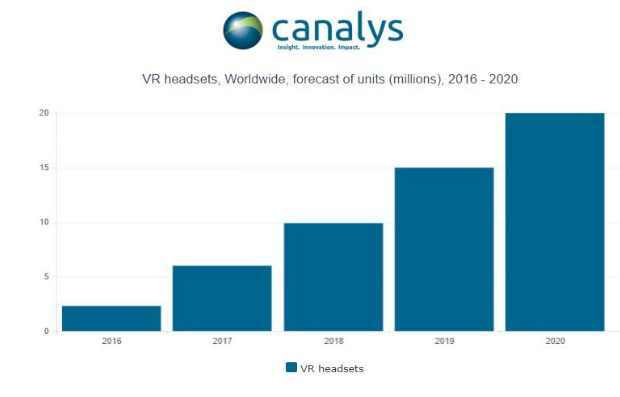 Shipments of smart VR headsets, which can function independently, will reach over 100,000 units. These estimates only include VR headsets with integrated displays, so exclude simple viewers, such as Samsung’s Gear VR and Google’s Daydream View, which are also shipping in the millions. As expected, Sony has quickly become the VR market leader, with its affordable PlayStation VR catering to the vast PlayStation 4 installed base. Canalys expects over 800,000 shipments in less than three months on the market. Shipments would have been greater if it were not for one key problem: PlayStation VR was delayed until October and is still seriously supply constrained due to problems making its OLED displays.